Cowls are fun cool weather accessories, and there’s just something about bulky yarn that makes them even more fun. This pattern combines the openness of tall and crossed stitches with the warmth of bulky yarn for a great little cowl. 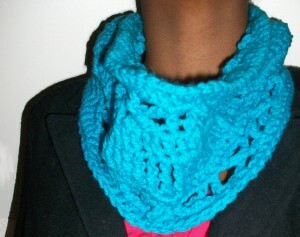 You will need to know how to do front crossed stitches to make this cowl. Gauge Swatch: 3″w x 3″h (7.5 cm x 7.5 cm) ch 11. This entry was posted on Wednesday, September 26th, 2012 at 12:00 AM by Candace	and is filed under Free Crochet Patterns. You can follow any responses to this entry through the RSS 2.0 feed. You can skip to the end and leave a response. Pinging is currently not allowed. Please explain what is FCdtr and how it is done.Thank you. Hi Maria! The Fcdtr is explained in special stitches section. To do it you’ll skip 4 dc, dtr in next dc, ch 3, dtr in first skipped dc. Joan, did you remember to ch 3 after completing the first half of the cross? Did I miss something? Ahh, I’ve never seen a “st” that combines 2 different rows like (what I read anyway:) the “dtr”. So that’s 1row dc, next row sc = 1dtr? This I got after reading the “gauge” swatch. Harrumph.